"The best two-hour vacation in town!" 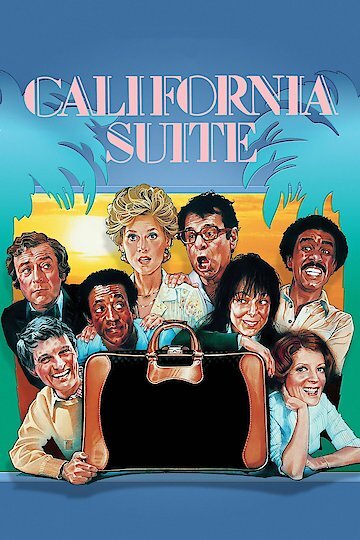 California Suite is an American comedy film that focuses on four different stories, all of which occur within the suite of a luxury California hotel. "Visitors from New York" focuses on the hard-working Manhattanite Hannah who flies to L.A. to grab her daughter, Jenny, whom had left with Hannah's screenwriter husband, Bill. The arguing couple is forced to figure out what's best for Jenny. "Visitors from London" focuses on Dianna Barrie, a British actress up for her Academy Award for Best Actress. While her professional life may have an upside, she deeply denies the growing troubles with her marriage to Sidney, a gay antique dealer. As the special day draws nearer, her mood grows increasingly unstable. "Visitors from Philadelphia" focuses on Marvin, a conservative and middle-aged businessman, whom wakes to find a prostitute, Bunny, lying in his bed; a present from his brother. With Marvin's wife minutes from entering the suite, Marvin rushes to find a way to hide his uncharacteristic infidelity. "Visitors from Chicago" focuses on Dr. Chauncey, Lola, Dr. Panama, and Bettina, a pair of couples who feel that they could use a vacation. As things spiral out of control, the couples agree to a highly-spirited tennis match. California Suite is currently available to watch and stream, buy on demand at Amazon, Vudu, Google Play, FandangoNow, iTunes, YouTube VOD online.